I was back at work today after a 3 week break. I was lucky to have so much time off so I shouldn’t complain about having to go back. I was eased back to corporate life gently as I worked from home today which made the adjustment and sticking to the healthy lifestyle easier. I had a fruity breakfast. 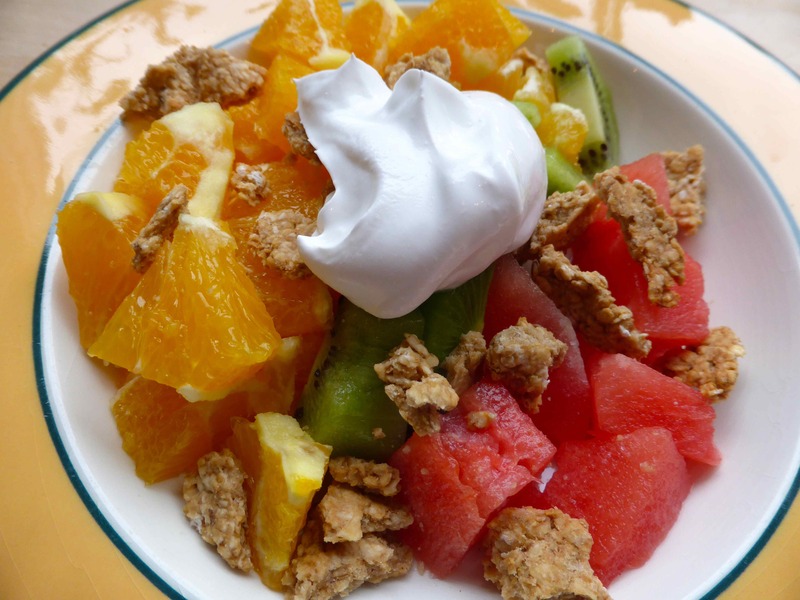 1 orange chopped up with a kiwi fruit, slice of watermelon, sprinkling of the granola I made yesterday and a dollop of Co Yo, a coconut yogurt. 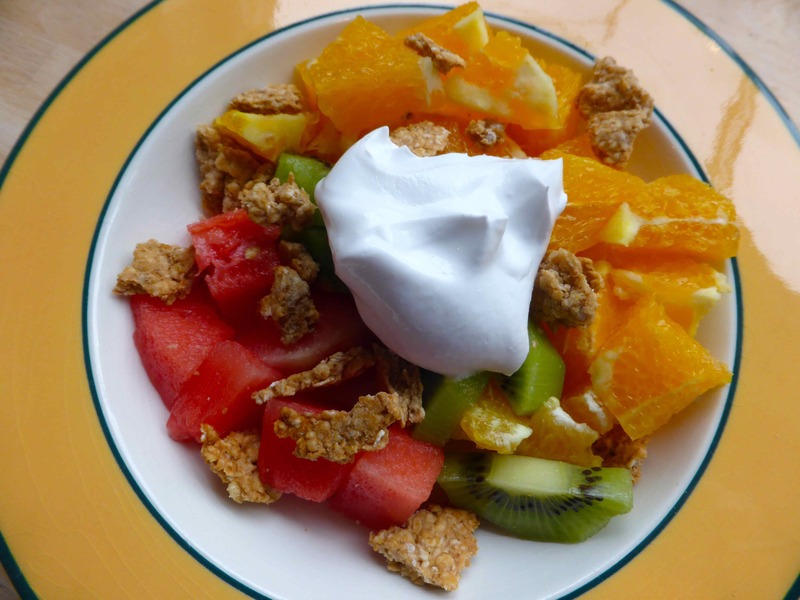 This was a great way to start the day and I have made something similar for breakfast tomorrow. I made a mistake at lunch time. A top tip for you all is that before adding chilli to a recipe, try it first! 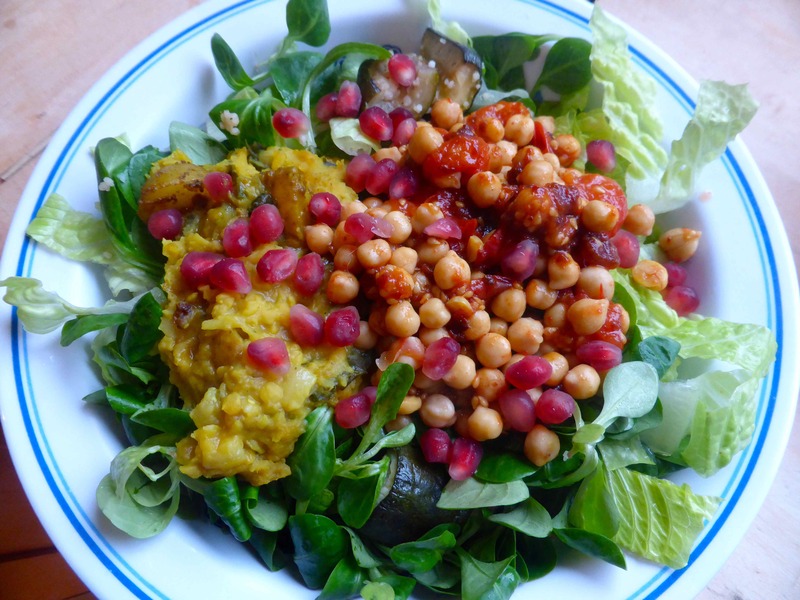 I made a large salad and the intention was to add some cooked toppings, using up leftovers. 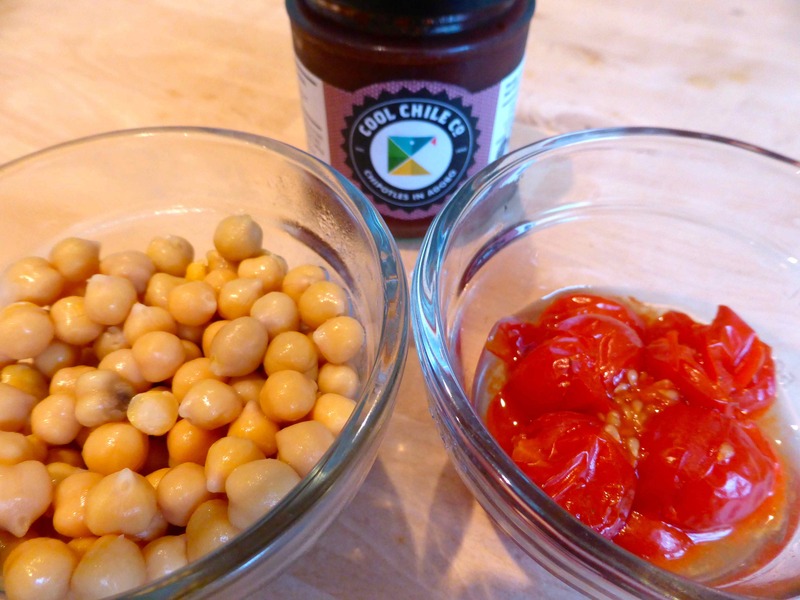 I warmed up half a can of chickpeas, some leftover roasted cherry tomatoes and, as it turned out, too large a spoonful of chipotle chillies. I was aiming for a smokey and spicy flavour for the chickpeas. It does look very pretty. 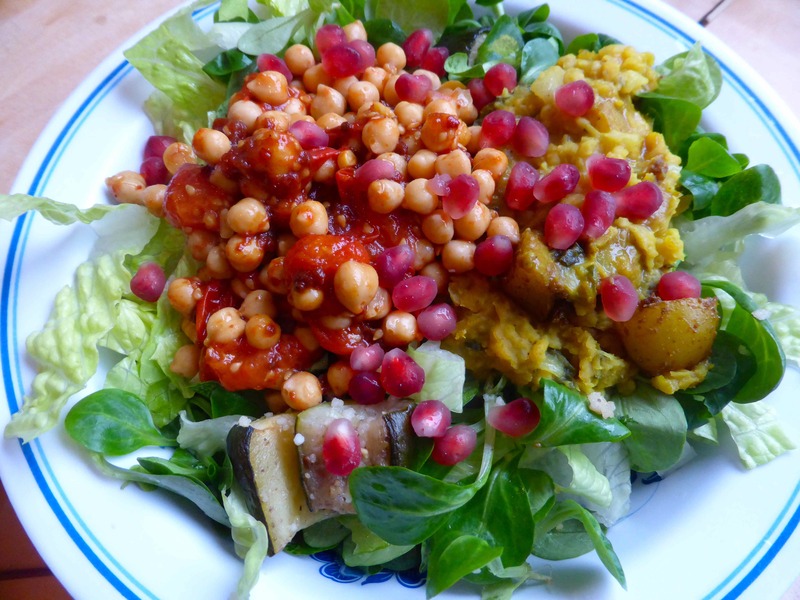 This colourful bowl is made from romaine and lamb’s lettuce, topped with heated up leftovers of roasted courgettes and peppers, red lentil and kale dal, Bombay potatoes and the spicy chickpeas, garnished with fresh pomegranate. The chickpeas were SMOKING!!!!!! Wow they were hot. I actually had to scrape them off and throw them away as they were too hot but at least I salvaged everything else. 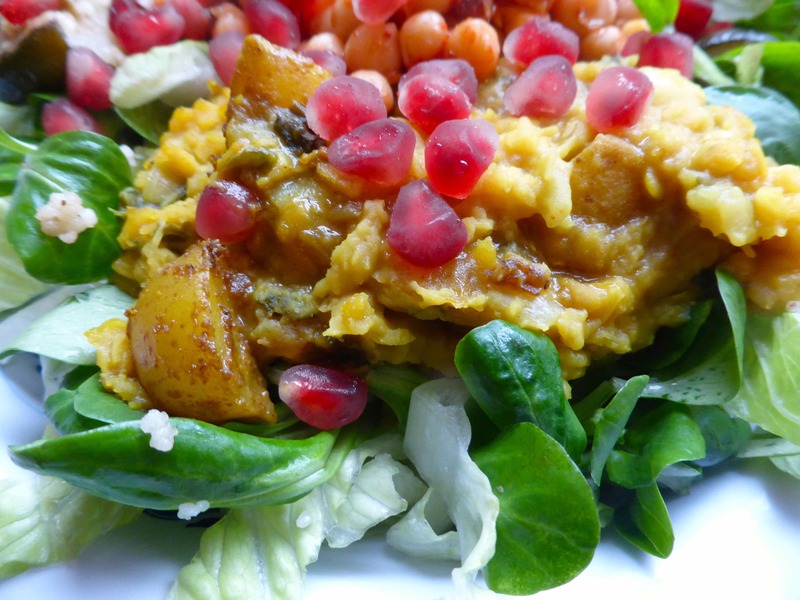 The Bombay potatoes and red lentil and kale dal reheated really well and the fresh and juicy pomegranate went really well with them. I will have to make these again and photograph the recipe so I can share it as all 4 of us really enjoyed the potatoes and the dal. For supper I made a vegan chilli with red pepper, onions, celery, garlic, chickpeas and black beans in a garlicy tomato sauce. We ate it with a jacket potato. It was good and there are 2 portions leftover for another evening. So I ate well, survived my first day back at work but failed to do any exercise. I really must be better at fitting in time to exercise! 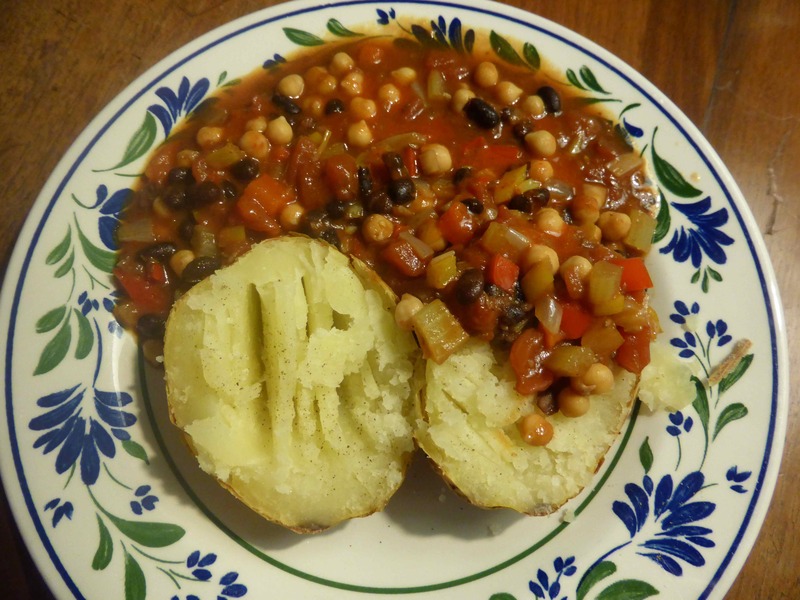 This entry was posted in Uncategorized and tagged Chickpeas, Fruit, Potatoes, Red Lentils, Vegan. Bookmark the permalink.